Posted on 2014-01-22 2014-01-22 Categories lifeTags christianity, orthodoxy3 Comments on How should we treat others? [photocommons file=”Armored-car-Manila.jpg” width=180]Derren Brown has produced a number of British TV Shows about priming that are really fascinating to watch. Even though he is a public figure, he is able to use priming to get people to do things they wouldn’t normally do, including, in one show, robbing an armed car. I just started reading You are Not so Smart, and the first chapter was on priming, appropriately enough. Priming is all about the subconscious — the extra-rational — something that, over the millennial, religions have adapted to. In the West, though, we don’t really seem to value things we can’t reason our way towards. You can see this in Christianity before the Enlightenment and even before the Protestant Reformation — even before the advent of Thomism — in the Roman Catholic dogma of transubstantiation. The Church saw “This is my body” and dogmatized the premise that made that statement literally true. Eastern Christians, who have been more comfortable with a mystical understanding of truth, simply accepted the statement as true without the need for philosophical and dogmatic exercises. Over time, I’ve come to the opinion that the different directions the Eastern and Western churches took on the idea of what has come to be known as the “real presence” are reflected in a lot of other areas — including what I have been calling the modern Cult of Reason. So, what does all this have to do with psychological priming? Priming is what happens when you act in a way that is largely influenced by your extra-rational mind. Priming is dependent upon cues that come from your environment. Derren Brown is adept at creating these sorts of cues for people, but you can also see these cues in the Liturgy of any Eastern Church. The smells, sights and sounds (which have all been developed over the centuries) all prime the person and provoke an extra-rational response. In the West, many protestant denominations explicitly shy away from creating this sort of “heavenly” environment. Many Mennonite churches, for example, explicitly shy away from any environmental cues. While they certainly are not as explicit in their rationalism as others – Presbyterians, for example — they’re like so many in the West who don’t seem to see any use in anything that cannot be rationally explained. But, as You are Not so Smart makes clear, even in the first chapter on Priming, we are not the rational, thoughtful creatures we imagine ourselves to be. 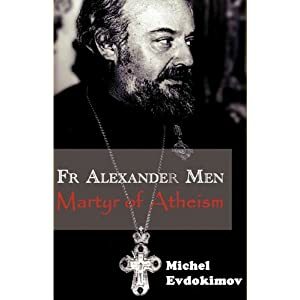 Today I got my cop y of “Fr Alexander Men; Martyr of Atheism”. Since I like to read this sort of book with my kids, I sat down with them and we read the first chapter. The book starts out with a broad overview of the history of the Church in Russia to provide a context for Fr Men’s birth and life. This is good for those, like me, who are mostly ignorant of history. As I’m sure many of you know, the Church in Russia did not have an easy time. As is clear from the first chapter, the Church became dependent upon the State and then had to cope when the States protection disappeared. My curiosity was piqued, though, by mention of the aborted Council of Moscow in 1918. The author says it had potential to be Russia’s Vatican II but, instead, became a dead letter. Research is needed! In the Eastern Orthodox tradition, this week is Cheesefare week and last Sunday was Meatfare Sunday — the last Sunday to eat meat before fasting begins in earnest. Brethren, food will not commend us to God. We are no worse off if we do not eat, and no better off if we do. Right when I could get bogged down in legalism and judging others, they have to give me this thought: I’m no better off. This is only a small aside from Cox’s chapter on the Bible: “Meet Rocky, Maggie, and Barry”. For the most part, I find this chapter fairly un-controversial — which is not to say that people aren’t going to argue with him, just that I don’t feel the need to. But the one thing I stood out was at the bottom of page 159 where he says: But here “faith” is once again debased into accepting as true something for which you have no evidence. The problem is that this is exactly how the word “faith” has been used for centuries — at least since the author of Hebrews wrote: Now faith is assurance of things hoped for, proof of things not seen. So what Hebrews calls “faith”, Cox calls “debased”. No wonder I’ve been struggling with The Future of Faith so much: he’s re-defining a clearly understood term and expecting everyone to play along. I imagine I’m not the only one confused. Since I couldn’t get to sleep, I read some more of Cox’s Future of Faith. Since I have read through most of his take on the early church (which I found especially hard to swallow — because of where he chose to put his emphasis and the frame that he used to present the history), I found the reading much easier. Perhaps it was also because I decided to read it as a Cox’s spiritual autobiography rather than, as the title suggests, a grand vision for how people of faith should live. Since, in these later chapters, I don’t feel the need to argue with him, I found myself agreeing with his assessment of where Christians are, for the most part, and where they need to go. As I read about his encounter with Ratzinger in “No Lunch with the Prefect”, I found myself agreeing with his vision for the role the papacy could play in Christianity. He clearly doesn’t understand the inertia of social systems — at one point he seems to expect the Catholic church to make a dramatic course change because we now “know” that Peter himself didn’t teach Apostolic succession, though almost all of his successors did. And his claim to “understand” fundamentalism because he spent a couple of semesters in college in <a href=”http://www.intervarsity.org/”>IVCF</a> is pretty shaky (though, he is right that he probably understands it better than those who lack even that exposure). But in these later chapters I find that I’m agreeing with him a lot more than in the earlier chapters. I don’t like his view of history and I think he could benefit from some more exposure to Eastern Christianity, but when it comes to where Christianity is at present, I don’t think he is far off.